My kids are in love with the Little Tikes Bubble Bellies from Imperial Toy! We were sent the dog on the bottom left, but there are four different animals to choose from. The Little Tikes Bubble Bellies retail for just $12.99 and come with an 8oz bottle of bubble solution included. Ideally for children ages 2 to 6, my five and seven year olds LOVED this. They are obsessed with bubbles to begin with - we even have a giant supply in our garage of bubble solution they have recently broken out for Spring - so they were thrilled to get this toy. After opening the mouth of the toy, there is a spot to pour the bubbles in. I did that to minimize the kids mess, snapped shut and let them loose with it. They squeeze the handle for non-stop bubble action. What I really liked was that the toy has a clear tummy so I can easily check the level of bubble solution. 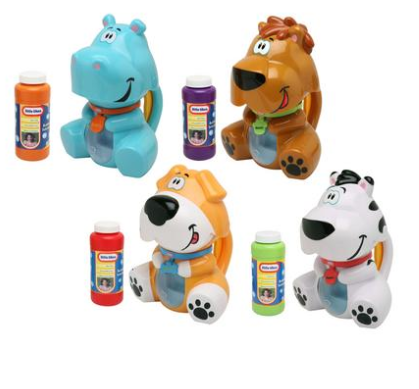 Little Tikes Bubble Bellies is sold at Target, KMart, Toys R Us and more. Here is the Doodle Bop giving it a try. We did find that the toy works better when held completely upright - the bubbles don't stop coming out when the boys squeeze the handle. If you tilt the toy to the side too much, you will not get the same flow. Here is the boys' review below. P.S. - They have played with this every.single.day. since it arrived at our house. Total winner! You can follow up with Bubble Bellies on the Imperial Toy website. Amazing! We need to get one. 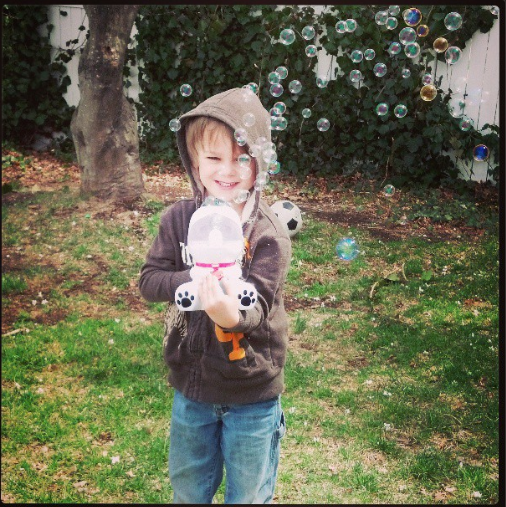 Addie would go nuts for some serious bubble action :-) Thanks for sharing! Seriously that thing is awesome. AMAZE! That hippo is so cute!! My Liza would love this! Ho cute! Kids love bubbles at any age! Great idea! Oh my goodness. How cute! My kids love bubbles so this will go over very well with them. Thanks for letting me know about this awesome product!